Do you encounter troubles with the process of window cleaning around your house? Your struggles are not enough to cleanse stains, water streaks and dust build-ups from glass surfaces? The professionals of window washing in Pimlico will give you a hand! Say farewell to the endless hours of polishing and wiping – the skilled and experienced team members will handle this problem. You will be able to enjoy your free time – just let us do this monotonous and exhausting chore for you. Our professional approach will grant you lots of benefits. We also provide our professional services in nearby areas: Nine Elms, Vauxhall, Millbank, Belgravia, Lambeth. We are glad to use the latest methods to make sure that you get the finest window cleaning. The glass surfaces of your house will be spotless after we use water-fed extension pole system and jet washing on them. We use our trucks to supply the poles with water and we can reach up to the fourth floor. In case you require polishing of highly-placed windows, we have rope access window cleaners ready to go. Call us on 020 3746 3113 and get in touch with us – these effective techniques will bring you results in no time. You can count on the abilities and competence of the experts for cleaning all types of windows. The glass surfaces in our expertise are: single or double windows, sash ones and bay windows. Of course, if you have garden windows, French doors, greenhouse or skylights, we will make them spotless, too. With our progressive methods and next-generation machinery, we can deal with all types of window cleaning, even with difficult to reach glass panes. With our experience and craftsmanship, the marvellous look of your property will be achieved immediately – the adepts of commercial window cleaning will achieve this. 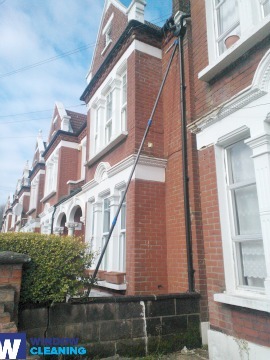 We utilise water-fed extension pole system for quick and effective window cleaning, up to the fourth floor. For office buildings taller than that, we use up-to-date rope access techniques. With our gear, we can reach the highest glass panes, even on the the highest buildings London is so popular with. From small shops to towering business scrapers, we assure you second-to-none services – book, now! Profit from our swift and reliable domestic window cleaning in Pimlico. We can clean the windows of your property in and outside. The products we use are environmentally friendly - you will enjoy the great end-results and be ecologically responsible. In addition, we use only purified water. Don't delay, ring 020 3746 3113 and order our second-to-none services. Our customer representatives will assist you – they are accessible 24/7. Another ways of booking – our request a cleaner online form or just chat with our customer care assistants.